Yeoh Li Tian is arguably our brightest young prospect, now nationally ranked No. 3 after breaking the 2300 barrier last year, and his participation in the HB Bank Cup International Open held in Ho Chi Minh City from 10-15 March 2014 was in my mind going to be a barometer of his progress. Unfortunately his (and his father's) desire to play the strongest possible events this year to confirm his level and to be able to move to a higher level meant he was going to choose between this tournament and the National Closed Championships. 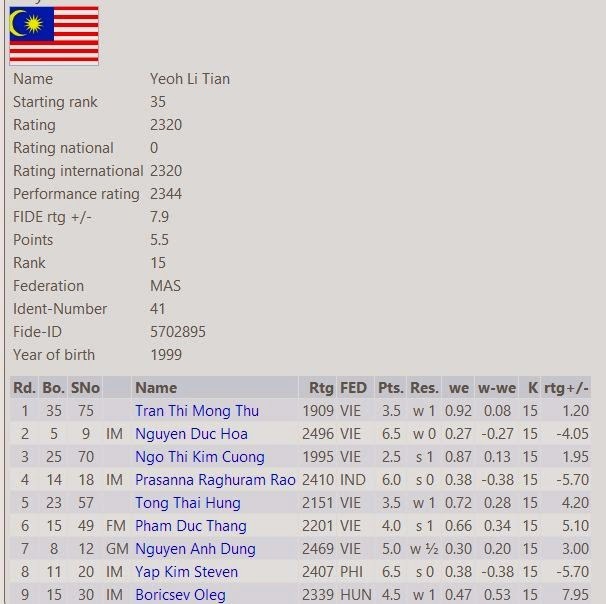 Going to Vietnam meant that if MCF sticks to the rules they have already announced as to national team selection, Li Tian would miss out on qualifying to the Malaysian Masters and so will unfortunately not be part of the Malaysian team at the coming Tromso Olympiad in August. HB Bank is now in its fourth year and it has never been a very large tournament, usually having less than 40 players participating of which the majority are Vietnamese (but with a couple of strong Chinese players invited), and once again this proved to be the norm. In the end, Vietnamese superstar (and defending champion) Le Quang Liem's making the trip back from the USA, where he is part of the SPICE program at Webster University, did not end as hoped for by the organisers as their other big talent Nguyen Ngoc Truong Son defeated him and emerged the winner in a trhee way tie-break. Going back to young Li Tian, besides his actual performance, I was very curious how he would do compared with Singapore's Tin Jinyao and the Philiipine's Paulo Bersamina, both players who have received a lot of hype over the last few years. Looking at Li Tian's games and the "black and white facts" as shown by the his results against his individual opponents, I have the impression of a player really not very much different than say a year or two ago and I would even argue he has played better. 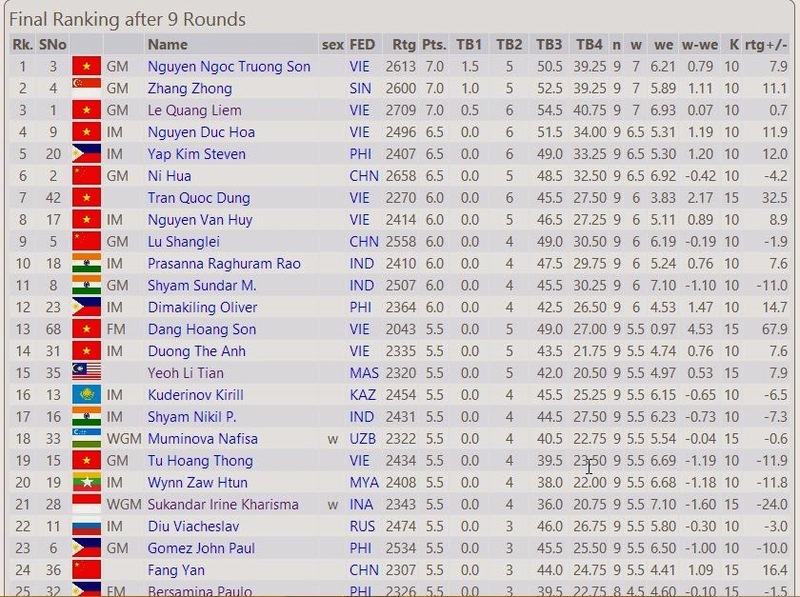 It seems like Li Tian is still not able to compete with the really strong players (and also the professionals able to wait their chance to exploit his limitations) but can easily hold and can even on occasion be able to beat veteran titled players. But on the plus side, Li Tian is picking up valuable experience and I do hope he is able to review his post tournament games not just with his father and a computer but with also other strong players so that he gets all the right lessons and then knows what he needs to do (and better) to be able to continue to improve. And it is of course nice that he picked up a few more rating points!